Like many other middle school students, Brandon Vance went on a class trip to Washington, D.C. Now, as an undergraduate university researcher, he will be headed back to the nation’s capital with a spot in the prestigious Posters on The Hill event with his name on it. Materials used with the reactor are at the ready in the Tessonnier Group lab where Vance conducts his research. Each spring the Council on Undergraduate Research (a nationwide membership group that assists collegiate administrators, researchers, staff and students in support of undergraduate research) hosts this special poster session that allows undergraduate college students from around the nation to show off their research projects to members of Congress and their staffers. Many apply. Few are selected. Vance is among 60 students who will display, from more than 350 who filed the paperwork for this year’s event, which will take place April 28-30. Vance is a senior in the Department of Chemical and Biological Engineering (CBE). His research project, “Designing Catalysts for the Direct Production of Methane Fuel on Mars,” is supported by a fellowship through the Iowa Space Grant Consortium, a NASA funded agency affiliated with the Department of Aerospace Engineering at Iowa State. His mentor is CBE associate professor Jean-Philippe Tessonnier and he’s an undergraduate member of Tessonnier’s research group. Vance is also a McNair Scholar at Iowa State, studying with assistance from the program that aids first generation, underrepresented, minority and low-income students in preparing for graduate school an attainment of a Ph.D.
Vance displays the reactor that is the centerpiece of the catalysis process that can be used on the surface of Mars to create rocket fuel. Vance joined Tessonnier’s group in the fall of 2017 and began working on this project in the summer of 2018 with the Center for Biorenewable Chemicals (CBiRC) Research Experience for Undergraduates here at Iowa State. “I then applied for the Iowa Space Grant Consortium fellowship so I could keep working on the project,” Vance said. 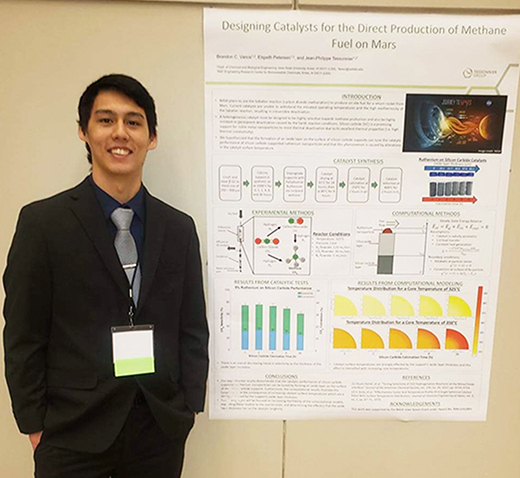 NASA is planning manned missions to Mars, and Brandon Vance’s research will help fuel rockets that will get people back to Earth. Vance’s project examines how to turn carbon dioxide and hydrogen gas into methane for that fuel. It’s known as carbon dioxide methanation, and is done through a catalyzed process (one which enables a chemical reaction to proceed at a faster rate or under different conditions than would normally be possible). It’s a procedure used in industry to create synthetic, or substitute, natural gas. But the catalysts currently used can’t stand the high operating temperatures that wouldoccur with this particular process that would take place on Mars. Vance’s project addresses coming up with a catalyst to overcome this, using a computational model he designed himself, along with dong the vast majority of the experimental work. Vance is shown with the research poster he will display to members of Congress in Washington, D.C. in April. The process involves using a reactor. But whereas most people picture a reactor as being a huge piece of equipment, the reactor Vance uses in this project is less than a foot in length. It was built by a former chemical engineering graduate student, Elspeth Petersen, who was part of Tessonnier’s research group and also focused on developing catalysis to produce methane for rocket fuel, in research that was also supported by the Iowa Space Grant Consortium. The biggest obstacle to overcome was the computational model. He reported it took more than three months to develop a model that gave physically meaningful results and provided true insight into the catalytic system being studied. 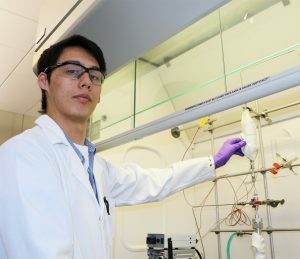 He has worked to develop models that demonstrate the effects of the detrimental heat transfer with the performance of the catalyst. 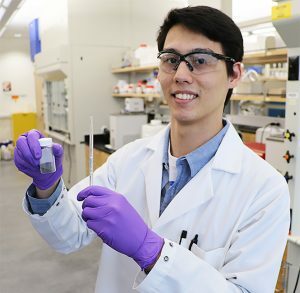 The Washington, D.C. event will top a list of opportunities that Vance has had to show his research in recent months, including an oral presentation at the McNair Heartland Research Conference in Kansas City, the 2018 Annual American Institute of Chemical Engineers (AIChE) Student Conference in Pittsburgh, and the recent 2019 Iowa Space Grant Consortium Student Research Symposium at Drake University. He will also present his poster at the annual Research in the Capitol event April 1 at the Iowa Capitol. 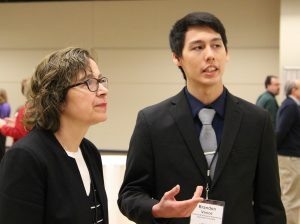 Vance explains his research to Maria Bohorquez at an Iowa Space Grant Consortium symposium at Drake University. She is the campus coordinator for the event, which provides a practice for students displaying their research posters. Middle school and high school students interested in coding and app development have the opportunity to practice their skills via the exciting platform of a NASA mission. In the “NASA App Development Challenge: Acsent Abort 2,” students work in teams to develop an app that visualizes three minutes of test data in support of the upcoming Ascent Abort-2 (AA-2) launch scheduled for June 2019. The challenge begins with a live virtual kickoff event and presentation March 13. Get more information in a document here or with the App Development Challenge web site here. 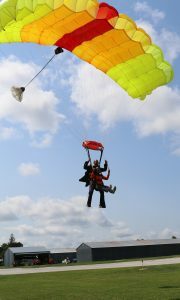 Still want to apply for Spaceflight Operations Workshop? Deadline’s been extended! The deadline to apply for the 2019 Spaceflight Operations Workshop™ (SOW) in the Iowa State University Department of Aerospace Engineering has been extended to 11:59 p.m, Sunday, February 24. Any collegiate student who would still like to be considered for this impactful experience in operational thinking and teamwork can apply here. Gonzalez-Torres. Anderson is a retired NASA astronaut who participated in two space flights with the International Space Station and Gonzalez-Torres is a former NASA flight director who was in charge of spacewalks. He worked with space shuttle and Hubble Space Telescope missions. 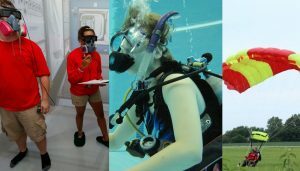 The workshop immerses participants in a series of experiences and classroom activities that are a microcosm of the training NASA astronauts undergo to develop their ability to “think operationally,” a key skill, applicable to many professions, and critically necessary for space exploration. In a span of about two weeks scuba diving training (including certification), skydiving, aircraft flight simulation, wilderness preparedness training and more are on the agenda. “We put them in some extreme environments, which is exactly what space travel is all about,” says Anderson. This year’s SOW will be held August 7-18, with home base at Iowa State University. Learn more about SOW here. 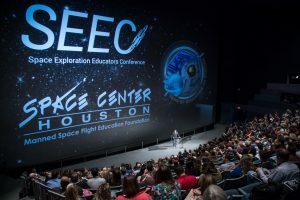 Eight Iowa Educators Join International Peers at Space Center Houston Educator Conference. 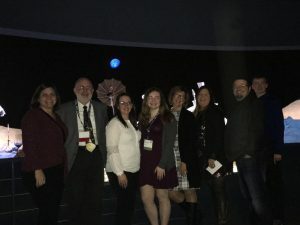 AMES, IA –This past weekend, the Iowa Space Grant Consortium hosted eight Iowa educators at the 25th annual Space Exploration Educators Conference at Space Center Houston. The educators included students preparing to be teachers, science teachers, an instructional coach, a media specialist and a faculty member from University of Northern Iowa. The conference provides ready to implement ideas for the classroom that can be used in all areas of education, not just science. Educators are empowered with knowledge through sessions led by astronauts, fellow educators, scientists and engineers who are passionate about what they do. 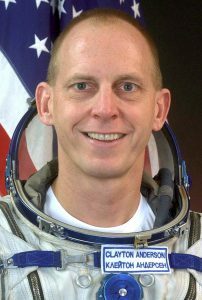 Clayton Anderson, Former astronaut and senior lecturer at Iowa State University, was among the speakers at the conference. He led a training workshop that taught teachers how to think operationally and bring that thinking back into their classrooms. 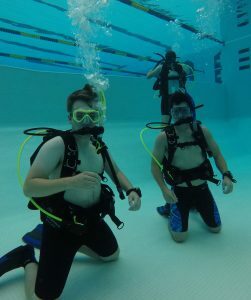 ISGC’s hosted team received unique, hands-on experiences like underwater diving sessions where they experienced microgravity and trained like real astronauts. Not every summer opportunity for college students involves skydiving, scuba dive certification and wilderness expeditions; but those who are seeking those opportunities and more on their to-do list are submitting their applications now (click here) for the 2019 edition of the Department of Aerospace Engineering’s Spaceflight Operations Workshop™ (SOW) August 7-18. The application deadline is quickly approaching and will close at 11:59 p.m. February 17, 2019. Coordinated by ISU Aerospace Engineering alumnus and retired NASA astronaut Clayton Anderson — also a senior lecturer in the department — the workshop immerses participants in a series of experiences and classroom activities that are a microcosm of the training NASA astronauts undergo to develop their ability to “think operationally,” a key skill, applicable to many professions, and critically necessary for space exploration. Hurry while there is still time to apply! Learn more about the Spaceflight Operations Workshop™ from an earlier news release here, and visit the SOW website here. 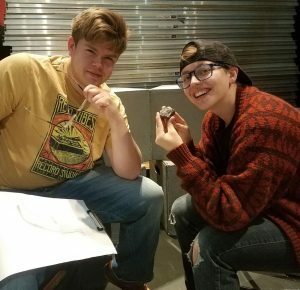 The University of Northern Iowa’s (UNI) “To Touch the Moon” stage production is gaining nationwide notice after an article recently published on Space.com. Funded by the Iowa Space Grant Consortium (ISGC), this newly shaped performance that promotes an interest in space, is geared toward youth with autism or other developmental delays. It ties in to this year’s 50th anniversary of NASA’s Apollo 11 moon landing mission. As she was developing the concept for the play, Berghammer met with the ISGC and was invited to tour NASA’s Marshall Space Flight Center in Huntsville, Alabama to conduct research to help with producing the play. 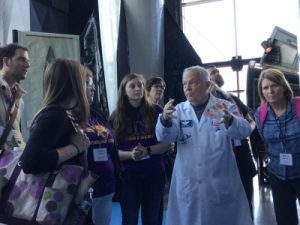 Marcy Seavy, who coordinates Science, Technology, Education and Math (STEM) education at UNI, Mark Parrott of UNI, who is set designer for the play and students from UNI also spent time at the Huntsville facility. 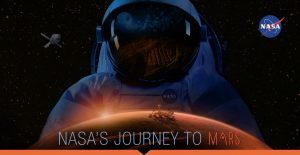 The play ventures into the human journey to the moon in three stages: myths and stories about the moon, work in the NASA labs, and events on the surface of the moon, promoting sensory awareness, social interaction, and nonverbal communication, sparking the curiosity of the STEM fields for ages 9-16. 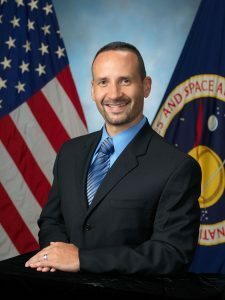 Tomas Gonzalez-Torres, director of the ISGC and a lecturer in the Iowa State University Department of Aerospace Engineering, and Jay Staker, ISGC associate director, are part of the advisory board for the production. Space historian Andy Chaiken is also on the board. There will be six performances of “To Touch The Moon” April 19-20 and 26-28, 2019, and they will directly serve 100 youth with autism. They will be held at the Bertha Martin Theatre on the UNI campus. For more information contact Greta Berghammer at gretta.berghammer@uni.edu. Articles about the play previously published by UNI can be viewed here and here.